TicketJames.com takes care of the sales and registration of etickets of concerts and events. Do you have questions about an order or event? Maybe this page will answer your question. What is the role of TicketJames? When do I receive the tickets? Why are service fees charged? Can I get in touch with the organiser? 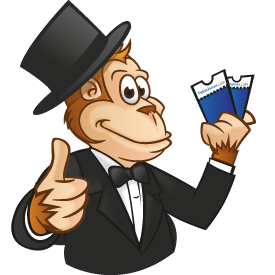 TicketJames is a mediator, who takes care of the technical side of the ticket sale: the order form, the settlement of the online payment and the register of the visitors on the day of the event. TicketJames has nothing to do with the organisation of the event itself, or matters linked to that neither is it accountable for that. In case of an disagreement we will try lok after the needs of the consumer, but the organisers are responsible for the customer service. After the payment or booking you received an email. If you did, the reservation succeeded. Did you not receive an email? Maybe you can find the email in the 'spam'box in your emailaccount. If you have not received an email at all, it would be best to contact the organiser to check whether the booking came through at all. After a successful payment you generally receive two, and sometimes one email: a confirmation of the payment and shortly after that an email with the tickets. Some organisers choose to not sent the tickets automatically, but to sent them manually a couple of days in advance of the event. If this is the case, the organiser will tell this in an email with the confirmation of the payment. An eticket is an admission ticket to a concert or event. Just like a 'normal' ticket, you need to bring the ticket as an entry permit. You can do this by printing and bringing the ticket. If you are not able to print the ticket, the unique number of the ticket (under the barcode) is sufficient. Discuss this with the organiser in advance. Every eticket is unique and via the barcodes the organiser can check whether the ticket is valid. If you cannot pay online or received a message that the payment failed, you can contact the organisor to take care of this. Contact the organiser in case of such an error notification. An organiser has the right to move or cancel an event. In case of moved events the tickets will remail valid for the replacing event. If you (in case of a moved event) cannot make it to the event on the new date or in case the event is cancelled, TicketJames will, in accordance with the policy of the concerning organiser, try to make sure you will refund the entrance fee as soon as possible. Service, administration, and transaction costs will not be refunded. If an event is canceled or moved, TicketJames will try her hardest to let you know by email as soon as possible. However, we cannot guarantee you are informed before the start of the event and are not responsible for the costs. Always use a correct emailadres when booking. The service fees cover among other things the system costs, data communication costs, selling expenses, administrative costs, costs for the customer service,banking costs (if not calculated seperately in the transaction costs) and admission control costs. Transaction costs for iDEAL and creditcard payments could be calculated seperately. Yes. On the order page of the event the contact details of the organisers can be found. If you cannot get in touch with the organiser that way, you can contact TicketJames. This website is secured by means of SSL (Secure Socket Layer) technology. You payment details will be scrambled and secured against misuse. For your online payment we use payment methods approved by banks. Details of bank or creditcard transactions will always be immediately communicated wit the bank or creditcard company and will never appear on the server of TicketJames.com.